Have conversations with your mobile users via the Messenger. First install Intercom on your iOS, Android and/or Cordova mobile app. Once you install Intercom, the Messenger will appear on the bottom right-hand corner of your users’ screen. Note: The Intercom for iOS library supports iOS 8.x and upwards. Intercom for Android supports API 15 and above. Next, you’ll need to configure your iOS, Android and/or Cordova app to your needs. You can set up custom data specific to who your users are and what they do in your app. And you can customize the Intercom Messenger to match your brand. We strongly recommend enabling identity verification on your iOS and/or Android app. Identity verification helps ensure that conversations between you and your users are kept private, and that one user can't impersonate another. Finally, if you’d like to send targeted push messages to your users you’ll need to enable push notifications on your iOS, Cordova and/or Android app (using either GCM or FCM). 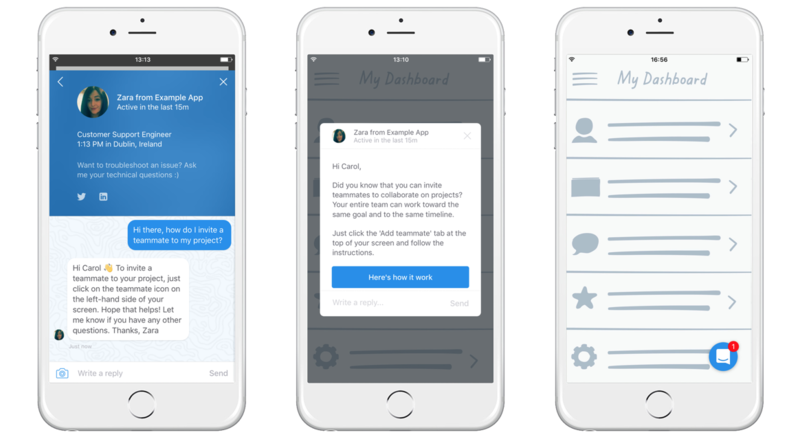 Once you’ve configured your mobile app to your needs, it’s time to get started with Intercom. First, we recommend checking out how real-time messaging works.